This segment’s topic is the new League formed in May 2018; first representing only Tecumseh, MI and now with membership throughout Lenawee County. What prompted a group of local women start a League; what are their goals and plans? I was a member of the League way back when…I was working on my Masters in Guidance and Counseling at Purdue and joined the League there as this was the first year I planned to vote and become active in politics (John Kennedy was running for President). I worked as a counselor in the Walled Lake School District and then Assistant Principal at West Bloomfield HS, worked on my Doctorate at UM Rackham, became an Asst. Principal at Boulan Park Middle School in Troy. Moved to Oklahoma and then Florida due to husband’s business so did not finish doctorate but opened my own business in Oklahoma and Rochester, MI. I now live in Tecumseh, MI. WHAT PROMPTED THE FORMATION OF THIS LEAGUE, WHO WAS THERE AT THE BEGINNING AND HOW DID IT COME TOGETHER? A core group grew out of a Lunch Bunch group that met once a month at various restaurants in the area and did lots of complaining about the political situation and where to get non-partisan information and to get non-biased educational information regarding the candidates. Remembering my West Lafayette experience with the League, I said the League might be a good resource and since I was the one who suggested it…. I got to research it. When we talked about politics in our lunch group, we did lots of complaining and I realized I actually researched buying my new truck and a new appliance more that I researched the candidates, both local and national who were running for office. Four of us met with the State Membership Chairman and Ann Arbor Membership and President at Webers to discuss the possibility of starting a Tecumseh Unit. This would allow Ann Arbor to mentor us for two or more years and get us established as a League of our own. Now we are at the point where we are ready to start the process of going off as our own League. There is a process for this that includes By-laws, Boards, and lots of bodies to accomplish all the work the League does even in off-election years. WHAT IS THE NAME OF YOUR LEAGUE? 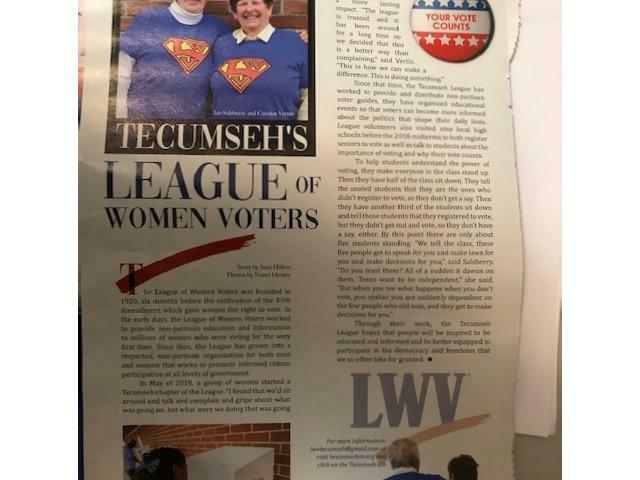 The League of Women Voters Tecumseh, although we are now representing the whole of Lenawee County with our membership roster. So, it might be changed to the Lenawee County/Tecumseh League. Members of the Tecumseh League include people (men and women) from all over Lenawee County, which includes Adrian, Onsted, Addison, Tecumseh, and Blissfield. We currently have 18 members, with new members joining all the time – probably 25 soon. WHAT ARE THE KEY INTERESTS/CONCERNS OF THIS PARTICULAR LEAGUE? Now that the election of 2018 is over, the Tecumseh Area League is planning to focus on local issues and the roles of our local elected officials. We realized that we knew very little about local officials and their roles…What does a County Commissioner do? How do our Courts operate and what is their jurisdiction? What qualifications do you need to run for City Council? One of our first Lunch and Learn events is coming up on January 16th with the Honorable Catherin Sala, who was just elected to the Probate Court speaking on the court system in Lenawee County and answering questions of “all things court”. Our next Lunch and Learn in February will have a County Commissioner speaking on what a County Commissioner is responsible for in running the County government. We also are in the process of printing our “Your Elected Officials” brochure which includes all the county, state and national elected officials. We will then include city officials for the various city and township governments as an insert. We hand these out at League events and to high school seniors. We encourage people to use them to contact their elected officials; citizen engagement is an important part of ensuring good government. WHAT DID YOU DO TO INFORM RESIDENTS PRIOR TO THE MID-TERM ELECTION? We had several public educational events regarding the three proposals on the ballots that included table events and speakers. We held a forum for the Tecumseh School Board election featuring 13 of the 14 candidates – a very large field to accommodate. The forum was held in our wonderful Center which holds around 700 people. It allowed us to sequester the candidates until their time to speak. Each candidate had specific times to introduce themselves and to answer two specific questions that all candidates answered and then to give a closing statement. A forum is conducted in a very controlled environment unlike a political debate. (from Tecumseh Herald: “To help the students understand the power of voting, they make everyone in the class stand up. Then they have half of the class sit down. They tell the seated students that they are the ones who didn’t register to vote, so they don’t get a say. Then they have another third of the students sit down and tell those students that they registered to vote, but they didn’t get out and vote, so they don’t have a say, either. By this point there are only about five students standing. “We tell the class, these five people get to speak for you and make laws for you and make decisions for you. Do you trust them? Suddenly it dawns on them. …you realize you are suddenly dependent on the few people who did vote, and they get to make decisions for you.). It was amazing to those of us who presented how little the students know about their government, they did not know the terms such as bi-partisan, non-partisan…how proposals got on the ballot, the difference between a Constitutional Amendment and a Legislative Act. It was also a good reminder and learning experience for those presenting and we have been asked to do it again this year in all the schools. We also went into several Senior Centers and Assisted Living Centers, as well as the Dominican Sisters Facilities to make sure they were registered and to help them with the Absentee Ballot process. Many of the elderly do not vote because they have moved to a new place of residency and have not registered in their new place of residency. They are the truly disenfranchised group. Most of them were really interested in the candidates for local government and especially in the ballot proposals. We put all the candidates running for office on the Vote411.org site. We got over 2,000 hits on the site – very good numbers for our first year. We also handed out over 700 printed Voters Guides throughout the county. WHAT HAS BEEN THE RESPONSE TO YOUR EFFORTS? Overall, response to our new organization has been extremely positive. We had close to 200 people at the Candidates Forum and as many as 60 at one of our evening meetings. Most events bring in 30-40 people. Our community and county are very interested in becoming educated about their political options and candidates and like the fact that the League is non-partisan. They also have expressed their appreciation that we are going to focus on local concerns and elected officials in the upcoming year. We get a lot of comments after presentations such as “Wow, I didn’t know that” and “I would like to hear more about this issue”, which is very encouraging. One person who was so delighted with the Vote411.org site as she hadn’t voted in several of the past elections because she knew nothing about the candidates. Doing the classroom exercise with the students. The delightful nun who said she couldn’t see to vote anymore and was frustrated because she couldn’t see or understand the ballot… but would definitely pray for the election (she was 98). 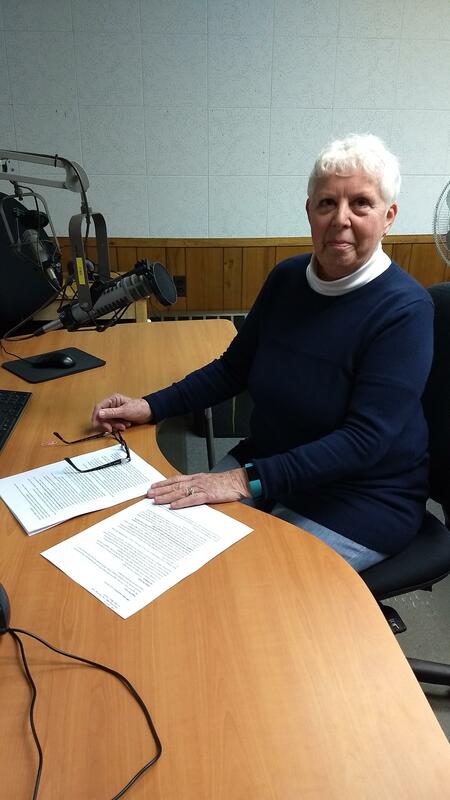 This week on "In the Public Interest," 89.1 WEMU’s Lisa Barry is joined by Ann McKee and Al McCord of the League of Women Voters of the Ann Arbor Area talk about Proposal 1, which will be on the ballot on Tuesday.